Do you have questions on any of our products? 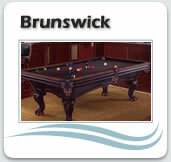 Brunswick is a name synonymous with Billiards. Masterpieces of craftsmanship, design and innovation, today’s Brunswick tables continue the legacy. They offer a complete line from the traditional styling to cutting edge design to meet everyone’s desire. Along with matching cue racks, player’s chairs, pub tables, bars, bar backs and bar stools. In addition, Brunswick offers table tennis conversion tops, air hockey and foosball tables.